Portugal is located in southwestern Europe. Portugal is bordered by the Atlantic Ocean, and Spain to the north and east. Google Earth is a free program from Google that allows you to explore satellite images showing the cities and landscapes of Portugal and all of Europe in fantastic detail. It works on your desktop computer, tablet, or mobile phone. The images in many areas are detailed enough that you can see houses, vehicles and even people on a city street. Google Earth is free and easy-to-use. Portugal is one of nearly 200 countries illustrated on our Blue Ocean Laminated Map of the World. This map shows a combination of political and physical features. It includes country boundaries, major cities, major mountains in shaded relief, ocean depth in blue color gradient, along with many other features. This is a great map for students, schools, offices and anywhere that a nice map of the world is needed for education, display or decor. If you are interested in Portugal and the geography of Europe our large laminated map of Europe might be just what you need. It is a large political map of Europe that also shows many of the continent's physical features in color or shaded relief. Major lakes, rivers,cities, roads, country boundaries, coastlines and surrounding islands are all shown on the map. 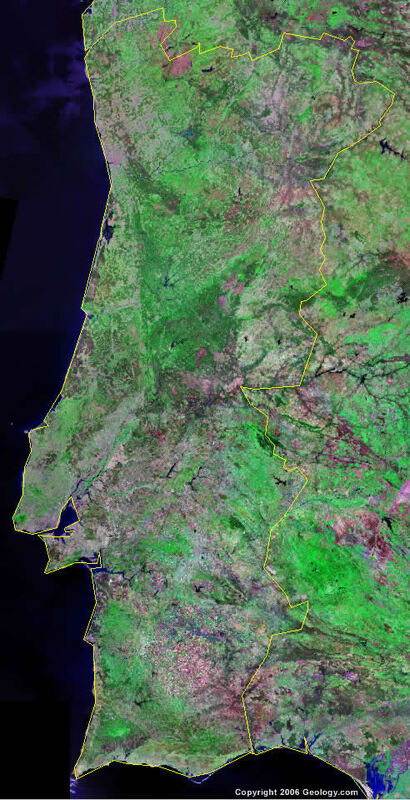 Abrantes, Alcacer do Sal, Almada, Amadora, Aveiro, Balenca, Barca d'Alva, Barreiro, Beja, Bendas Novas, Braga, Braganca, Caldas da Rainha, Castelo Branco, Chaves, Coimbra, Covilha, Elvas, Estremoz, Evora, Fafe, Faro, Figueira da Foz, Guarda, Guimaraes, Lagos, Leiria, Lisboa (Lisbon), Marinha Grande, Moita, Montijo, Moura, Olhao, Portalegre, Portimao, Porto (Oporto), Sagres, Santarem, Serpa, Setubal, Sines, Tavira, Tomar, Viana do Castelo, Vila do Conde, Vila Real and Vilar Formoso. Atlantic Ocean, Baia de Setubal, Barragem de Alqueva, Barragem de Campilhas, Barragem de Montargil, Barragem de Pracana, Barragem do Alto Rabagao, Barragem do Cabril, Barragem do Maranhao, Barragem do Pego de Altar, Buadiana River, Chanca River, Douro River, Foz do Rio Tejo, Foz do Rio Vouga, Golfo de Cadiz, Lima River, Minho River, Mondego River, Paiva River, Sado River, Tagus River, Tamega River, Tejo River, Tuela River and Zezare River. The numerous metal resources for Portugal include iron ore, copper, zinc, tin, tungsten, silver, gold and uranium. A variety of other natural resources are present in this country including marble, clay, gypsum, fish, cork forests, salt, hydropower and arable land. The Azores of Portugal are subject to severe earthquakes. Portugal has water pollution, especially in the coastal areas. Other environmental issues for the country include air pollution caused by the industrial and vehicle emissions, and soil erosion.